A fascinating group of animals that shares a unique anatomy, behaviour and ecology and are unique for the Andean cultures of South America. Fauna Australis logo includes a group of vicuñas in the Surire salt-lake, a fascinating place on top of the Chilean altiplano (4,200 absl) where everything began and our research group was born. The so called sustainable use of the vicuña and guanaco needed a different approach and we started to research on welfare and ecological consequences of capturing and shearing nearly 30 years ago. Arzamendia, Bonacic C, Vila B. Behavioural and physiological consequences of capture for shearing of vicunas in Argentina. Applied Animal Behaviour Science. 2010;125(3-4):163-170. Riveros JL, Bonacic C, Schuler G, Hoffmann B, Chaves MG, Urquieta B. 2010. Ovarian follicular dynamics and hormonal secretory profile in guanacos (Lama guanicoe). Anim. Reprod. Sci. 119: 63-67. Bonacic C, Gimpel J and Goddard. 2009. Animal Welfare and the Sustainable Use of the Vicuña. In: The Vicuña: The Theory and Practice of Community Based Wildlife Management. Gordon IJ, ed. Pp. 49-63. Springer Science. Business Media. Sarno RJ, González BA, Bonacic C, Zapata B, O’Brien SJ, Johnson WE. 2009. Molecular genetic evidence for social group disruption of wild vicuñas Vicugna vicugna captured for wool harvest in Chile. Small Ruminant Research. 84 (1): 28-34. Riveros JL, Urquieta B, Bonacic C, Hoffmann B, Bas F, Schuler G. 2009. Endocrine changes during pregnancy, parturition and post-partum in guanacos (Lama guanicoe). Anim. Reprod. Sci. 116(3-4):318-325. Riveros JL, Urquieta B, Bonacic C, Bas F, Hoffmann B, Schuler G. 2008. 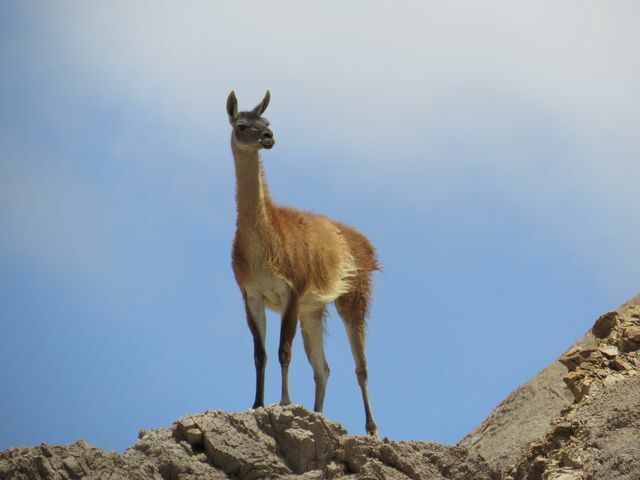 Endocrine changes during pregnancy in the guanaco (Lama guanicoe). Reproduction in Domestic Animals. 43 (s3): 96. Urquieta B, Araya R, Riveros JL, Bonacic C. 2008. Parturition in guanacos (Lama guanicoe) maintained in captivity: A behavioral and endocrine approach. Reproduction in Domestic Animals. 43 (s3): 96. Riveros JL, Schuler G, Chaves M, Hoffmann B, Bonacic C, Bas F, Urquieta B. 2008. Ovarian follicular dynamics in non gestating guanacos (Lama guanicoe) in captivity. Reproduction in Domestic Animals. 43 (s1): 27. Marín JC, Spotorno AE, González BA, Bonacic C, Wheeler JC, Casey CS, Bruford MW, Palma RE and Poulin E. 2008. Mitochondrial DNA variation and systematics of the guanaco (Lama Guanicoe, Artiodactyla: Camelidae). Journal of Mammalogy. 89:269-281. Arzamendia Y, Maidana R, Vilá B and Bonacic C. 2008. Wild vicuñas management in Cieneguillas, Jujuy. In: South American camelids research. Volumen 2. Frank E, Antonini M and Toro O, eds. Pp. 139-146. Wageningen acadedmic publichers. Marín J, Zapata B, González C, Bonacic C, Wheeler J, Casey C, Bruford M, Palma E, Poulin E, Alliende A y Spotorno A. 2007. Sistemática, taxonomía y domesticación de alpacas y llamas: nueva evidencia cromosómica y molecular. Rev. chil. hist. nat. 80: 121-140. Sarno R, Villalba L, Bonacic C, González B, Zapata B, Macdonald D, O’Brien S and Johnson WE. 2004. Phylogeography and subspecies assessment of vicunas in Chile and Bolivia utilising mtDNA and microsatellite markers: implications for vicuña conservation and management. Conservation genetics. 5: 89-102. Zapata B, Gimpel J, Bonacic C, González B, Riveros J, Ramírez A, Bas F and Macdonald D. 2004. The effect of transport on cortisol, glucose, heart rate, leukocytes and body weight in captive-reared guanacos (Lama guanicoe). Animal welfare. 13: 439-444. Bonacic C and Macdonald D. 2003. The physiological impact of wool-harvesting procedures in vicuñas (Vicugna vicugna). Animal welfare. 12: 387-402. Bonacic C, Macdonald D and Villouta G. 2003. Adrenocorticotrophin-induced stress response in captive vicuñas (Vicugna vicugna) in the Andes of Chile. Animal welfare. 12: 369-385. Zapata B, Fuentes V, Bonacic C, González B, Villouta G and Bas F. 2003. Haematological and clinical biochemistry findings in captive juvenile guanacos (Lama guanicoe Müller 1776) in central Chile. Small Ruminant Research. 48: 15-21. Bonacic C, Gimpel J and Galaz J. 2002. Current advances on research and management of the vicuna (Vicugna vicugna) in Chile. Ciencia e Invest. Agr. 27:39-50. Bonacic C, Macdonald D, Galaz J and Sibly M. 2002. Density dependence in the camelid Vicugna vicugna: The Recovery of a protected population in Chile. Oryx. 36: 118-125. Johnson WE, Slattery JP, Eizirik E, Kim JH, Menotti Raymond M, Bonacic C, Cambre R, Crawshaw P, Nunes A, Seuánez HN, Martins Moreira MA, Seymour KL, Simon F, Swanson W and O’Brien SJ. 1999. Disparate phylogeographic patterns of molecular genetic variation in four closely related South American small cat species. Molecular Ecology. 8: S79-S94. Franklin WL, Bas F, Bonacic C, Cunazza C and Soto N. 1997. Management of Patagonian guanacos in the grazing agroecosystems of southern Chile. Wildlife Society Bulletin. 25: 65-73. Bonacic C, Iriarte A and Bas F. 1996. Endangered guanaco (Lama guanicoe) population habitat use in the Andean mountains of Chile. Journal of wildlife research. 1: 85-88.Bonacic C and Gimpel J. 1995. Sustainable use of South American wild camelids: theory and practice. Newsletter of the European Fine Fibre News. 5: 23-26. Bonacic C and Gimpel J. 1995. Guanaco farming in Southern Patagonia, Chile. Camelids Chronicle. 33: 11-14. Bas F, Bonacic C and Soto N. 1994. Game farming potential of the guanaco (Lama guanicoe) in Chile. Journal of Animal Science. 72: 343.